Bangladesh is a blessed with abundant of solar energy. It receives 4-5 hours per day of solar energy with about 300 days of annual sunshine. Despite lack of commercial usages, large potential solar energy has been using in traditional uses such as crop and fish drying in the open sun. There is a fast growing acceptance of rural people to solar photo voltaic (PV) systems to provide electricity to householders and small business in rural off grid areas. In city areas while taking new connection some percentage of load demand must have to install solar panel in their premises. Solar home system (SHS) is very much popular today for rural people, Some solar irrigation pump also established but it does not come popular due to high installation cost. In some other cases solar power uses in small scale. The Government, Non- Government and private sector already come to develop the total solar system infrastructure in Bangladesh. Solar battery charging system is the beginners outline of the Battery charging station which can be worn as an alternation of the complimentary power source or electricity for assembling the ever increasing demand of our country. Batteries are used in different way, some are used in vehicle, some are IPS and some are used in machineries. In present system all batteries are charged by electricity. Three wheeler battery, driven vehicle had found some days before in the city area besides the normal vehicle. Many three wheeler rickshaw are running in the rural area. A pulled rickshaw is a mode of human powered transport by which a runner draws a two wheeled cart which seats one or two people. In recent times the use of human powered rickshaws has own discouraged or outlawed in many countries due to concern for rickshaw workers. An auto rickshaw also known as a three wheeler is a motorized development of the traditional pulled rickshaw or cycle rickshaw. Auto rickshaws are three wheeled vehicles used extensively in much rural area. In present system different types of battery driven auto rickshaw are found in our country. Easy or auto bike model 4-5 passengers are carried and in auto rickshaw model only 2 passengers are carried. Another model is found as rickshaw-van which is used for carrying goods. Electricity Powered , green and fast power rickshaws launched by some private initiatives, have grown a certain level of popularity in rural area and near big cities. Its mass introduction could lead to a revolution in rural transport. It would increase the economic flow of the rickshaw pullers and cut transport time and pullers effort down to half. But the improvements are yet to be wide spread because the power rickshaws has been claimed to consume a considerable amount of electrical energy from our national power grid. A new entrepreneur may designed and developed a solar Battery Charging Station for charging the batteries of auto rickshaws, which would be completely independent of the national grid. The solar charging station not only takes a significant role for rural people but opens a way to help boosting up the socio-economic condition of Bangladesh. If we design for 10 auto rickshaw charging per day then energy consumption will be required 66700w-hr (apps.) . Battery bank capacity needed for storing charge 2058 A-hrs. Solar system needed 21 KWp¸ each solar panel array capacity will be 5 KWp and 4 array are in parallel, where system voltage will be 180-220 volt. Charge controller may be fast chargers, It is higher power units, designed to charge in less than 4 hours. These chargers require active charge termination and often have advanced features such as battery test, bad battery recovery, and automatic maintenance. There are several ways to charge batteries from DC power source. Solar panels require a special type of charging called a solar charge controller. In this system charge controller needed 4 nos. These are able to take whatever power is available from the solar panels, condition that power and transfer it to the battery. These chargers are specially designed to deal with the uncertainty of the available input power. It may be customized for different demand for any system. Day by day costing is decreasing in the solar panel as well as total system. So, to develop this system in rural area, It will be financially viable where grid line is not available. 1. The auto rickshaw owner comes with vehicle at the charging station and put it for charging. 2. The charging station owner will have some sets of batteries and charging those by the system which will be supplied to vehicle as a rental basis. A case study is given here that market place name “Lalhara” under Delduar upozilla, distance from Delduar to 5 km & from Elashin 3-4 km. Here more than 100 auto rickshaw & three wheeler running daily for carrying passenger. Most of the three wheeler auto rickshaw driven by CNG or oil and some portion of rickshaw are driven by battery & others are driven by human. CNG station is not available here, it is situated in Tangail district where 15 km from there, to get CNG need running more than 30 km, So, CNG wastage for this. Battery driven auto rickshaw owner or driver, they use their residence electricity to charge the batteries or illegal sources. In another way, if there are no electric connection of rickshaw owner, they have to depend on others to charge the batteries by dint of high payment. In rural electricity scenario is very bad, They did not charge their batteries properly, So they have to face many problems. In this circumstances if the facilities are made to charge the batteries by other reliable sources at their adjacent area then it will be better for those people to run their battery driven auto rickshaw easily. In near future to meet the growing need for electricity has led to country wide dissemination of solar energy based electricity generation system that incorporate battery stores through the use of Solar Home Systems (SHSs) and a large portion of the country’s population is dependent on a strenuous means of livelihood that is rickshaw (tricycle) pulling. To handle the problems, implementation of Solar Battery Charging Station (SBCS) has emerged to the rural Bangladesh as well as in urban areas to change the scenario. 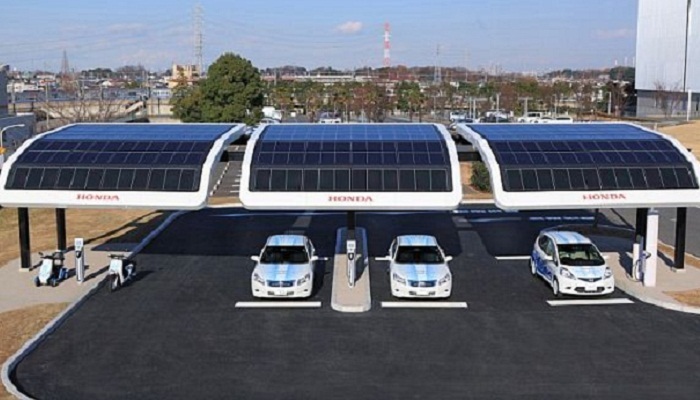 Solar battery charging station is a new concept to be developed all over in Bangladesh by utilization of solar power, also it will plays an important role to build a green environment as well as green Bangladesh.